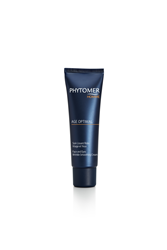 A 2-in-1 treatment for men to reduce shine, fatigue and wrinkles. AMM Marine Sugar deposits an invisible, natural film on the skin’s surface that captures sebum like a micro-sponge. Although men’s skin is 25% thicker than women’s, frequent shaving, pollution and stress can weaken the epidermis, causing premature damage and aging. AGE OPTIMAL Face and Eye Wrinkles Smoothing Cream is a powerful concentrate designed to smooth and reinvigorate men’s skin, with dual action, treating the face and eye contour. PHYTOMER researchers selected four powerful marine extracts in this new formulation to reduce shine, increase oxygenation, smooth and decongest skin. Key ingredient, AMM Marine Sugar deposits an invisible, natural film on the skin’s surface that captures sebum like a micro-sponge. Upon application, its ultra-refreshing sorbet texture gives skin an immediate boost, while decongesting and intensely hydrating skin, leaving a light masculine aquatic/woodsy scent. Directions for use: apply morning and evening to the face, neck and eye contours on perfectly cleansed skin. AMM Marine Sugar - produced using biotechnology in the PHYTOMER laboratories, this natural marine sugar possesses an exception purifying capacity. By limiting the secretion of sebum, it offers a long-lasting matifying effect. Delesseria Sanguinea - draining and decongesting algae, stimulates micro-circulation to reduce signs of fatigue. Marine Oxhylium - extract of red algae, boosts cellular vibrancy with its high mineral and oligo- element content. Marine Criste Oil - a seaside plant, accelerates cell renewal and smooths the surface of the skin. *Satisfaction test on 22 men. Twice-daily application for 28 days.